Well, hello there! 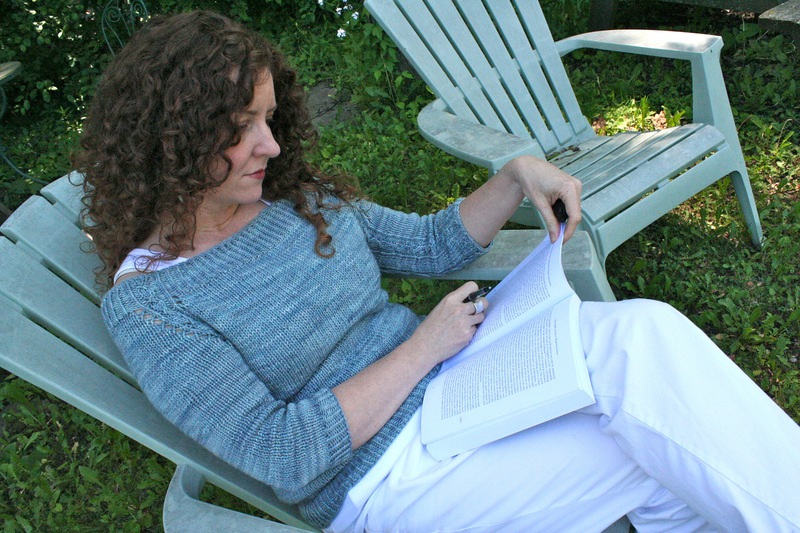 It’s been awhile, but I’m still here and still knitting – and even finishing a project here and there. Today is my birthday, and in an effort to “start as you mean to go on,” I thought I’d start the year by blogging. I finally cast on for the sweater at the beginning of April. It was a sweet knit, as I expected i would be. Knit in The Plucky Knitter Merino Lite, in about 750 yards. I made a stupid decision with this sweater, though. I cast on for a size 38 when I had intended to do a size 36 (for a little negative ease). When I realized my mistake, I decided to just go ahead and do the bust as a size 36 but leave the neckline in the size 38. I should’ve known better since the neckline is so wide already. More on that in a moment. 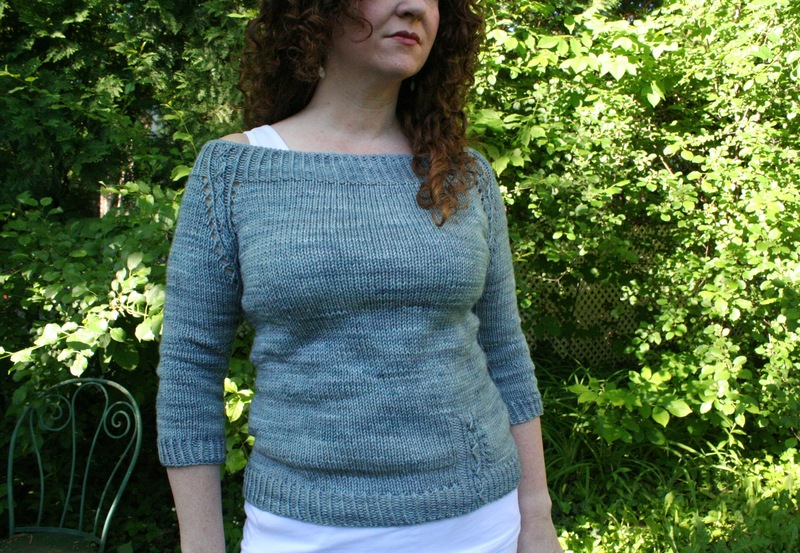 Even with a wee bit of negative ease in the bust, the sweater itself fits comfortably without being slouchy. I wore it to work yesterday and was very happy with it. I got lots of compliments on it. My husband really likes the neckline (I do, too!). But the truth is, it bloomed in blocking far more than I expected. Everything fit *perfectly* before I blocked. The neckline was wide enough without falling off my shoulders. Then I blocked and it all came out huge! I was so disappointed. I crocheted a single chain around the inside of the neckline, which helped a little, but not nearly enough. A friend recommended that I spritz it and toss it in the dryer for a few minutes. I did that, and it did make a difference. I felt like it needed more, but I was afraid to dry it further for fear of how the dryer seemed to be roughing up the yarn. Any suggestions? 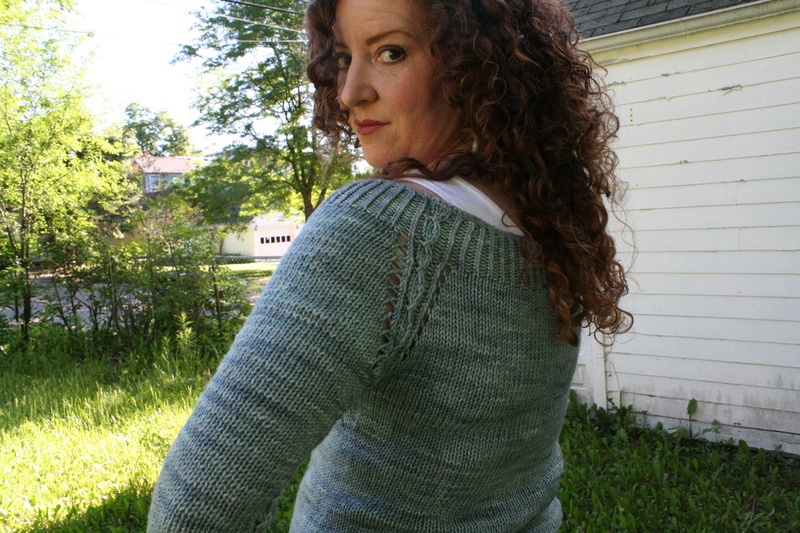 I’m wondering if I can somehow tack down the inside of the neckline in a couple of places. I would be interested in any advice anyone wants to offer! 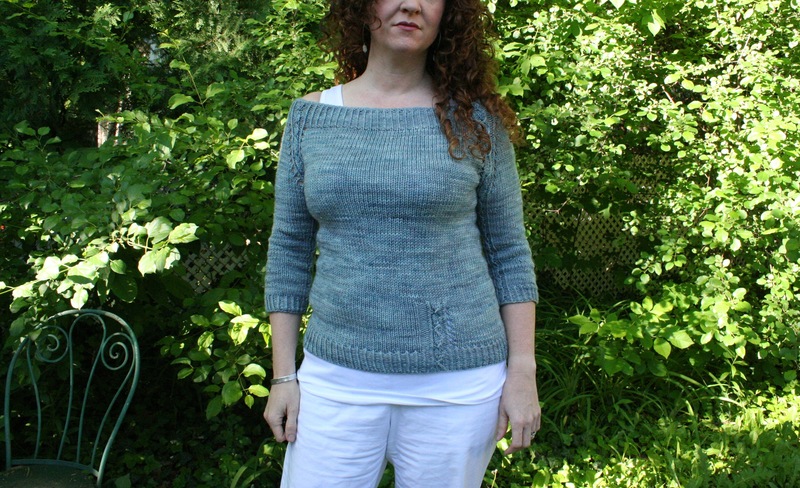 Other than that – which is my fault, not the pattern’s – I’m thrilled with this knit. 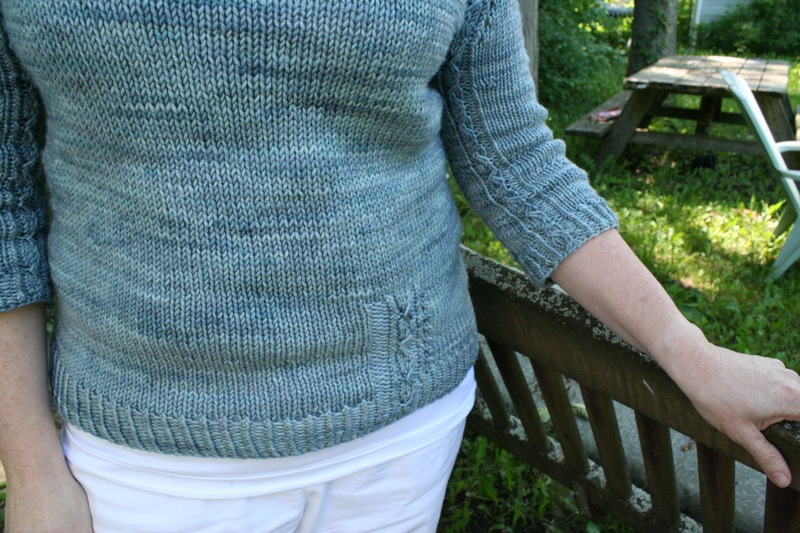 Fast, fun, and imminently wearable, in a yarn I love and a color I *adore*. I loved this babycocktails/thepluckyknitter match-up so much that I’ve already begun another (Cape Cod). It is zipping along and I hope to be showing it to you soon. In the meantime, I’m looking forward to getting a lot of wear out of this sweater. Happy Birthday! 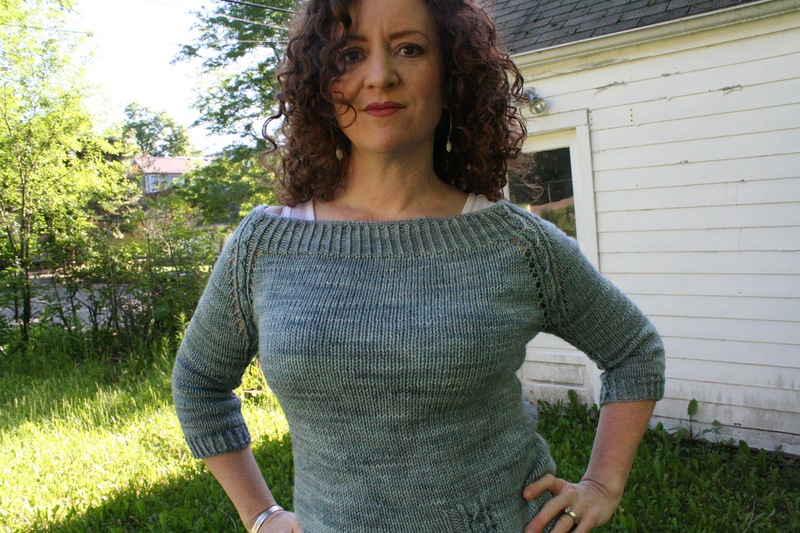 I have no suggestions on the sweater – it looks great! 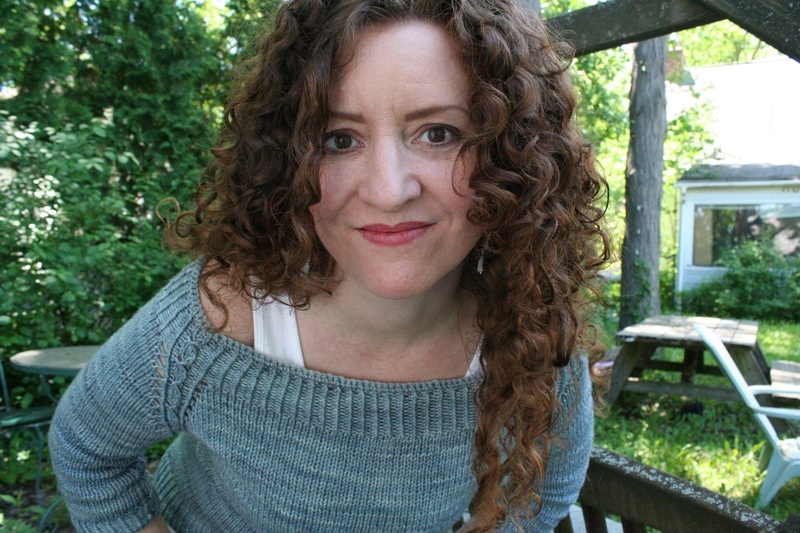 Happy birthday, and that sweater is rather fabulous on you–although I know super wide necks are hard to wear if you move around a lot. Belated happy birthday! Try some of that sock elastic to snug up the insides. See Techknitter’s tips (http://techknitting.blogspot.com/2011/02/socks-falling-down-consider-elastic.html; – section “Thread elastic added afterwards”) for a technique that might work well here.